Way back at the Halloween Party they gave a prize to two people for best costume or something like that. 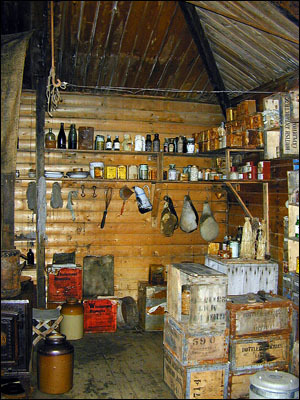 The prize was a boondoggle to Cape Royds, one of the early huts built by Shackleton and his men in 1908. That makes it an exciting place to go. 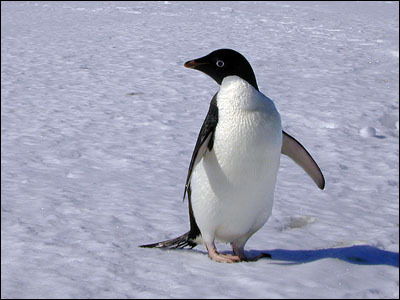 It is exciting also because it is 22 miles north of here, and there is a penguin rookery located there as well. The two guys who won the prize had already been there several times and so they decided to auction off their prize. They put up a notice saying they would give their prize to the lowest bidder. Everyone thought it was a joke because of the lowest bidder part. Anyway, my roommate and I decided to write to them and make an offer. We decided that most people would be bidding a penny or something like that, so we said we bid that they come and clean up our room for us and work for us for a day. Surprisingly, they thought it was a clever response and gave us the prize. We were stunned. They didn't clean up the room or work for us, but who cares. As an aside here, there are always things that you can sign up for, like our trip to Cape Evans and such. But sometimes they like to slip in some bogus things to try and catch the new people. First timers down here are called FYN–G'S pronounced finjy and stands for First Year New Guy), and those tricks are better known as FYN–G bait. My roommate, Rebecca, and I sign up for most everything just in case. We bought the FYN–G bait about swimming with the cod and signed up. We took a little ribbing for that but it was all in good fun. As for Cape Royds, we had to wait until Recreation could coordinate the trip, but finally we got to go. To take a large vehicle like a Delta or something all the way to Cape Royds would take way too long. Also, the ice edge has progressed to only 5 miles beyond there so large vehicles are not advised at this time of year. 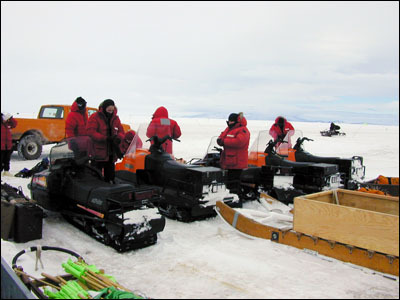 We got to make the journey on Ski–Doos (something like a snowmobile). Rebecca and I took turns driving the Ski–Doo. That alone was a lot of fun, but the whole trip was very exciting. It was also on a work day so we got to miss a day of work as well. That was especially nice. Of course we had to be wearing all of our ECW gear in case there was a change in the weather. They brought packed lunches for us. We met at 8:45 A.M. and discussed the trip, driving the Ski–Doos, etc. By the time we got packed up and ready to go it was just about 10 A.M.
Just a few miles out we passed a seal lying on the ice. Ted, our guide, gave the signal to stop and we all walked over to see the seal. The hole that they come up through was nearby and while we were there the male surfaced several times. It is really amazing to see that these animals aren't the least bit afraid of us. It is so nice. 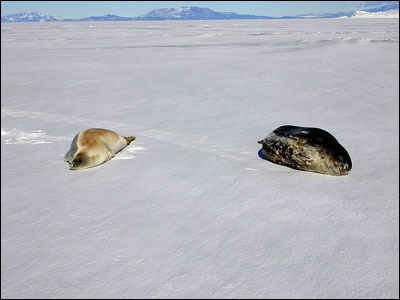 The seals lie around on the ice totally indifferent to us or the loud Ski–Doos. They will look up at us occasionally, but that is about it. 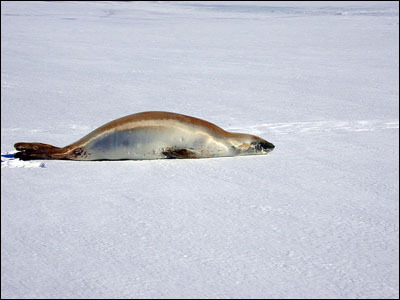 Since they just lie around they have gotten the nickname of sea slugs as that is how they seem while lying on the ice. However, I learned from Randall Davis (the scientist who is in charge of Davis Camp which I wrote about earlier in the season) that under the water, they have clocked these seals swimming as fast as 6 meters per second! Dolphins don't even swim that fast. It was a surprise to everyone. After watching the seal for a while we got back on the Ski–Doos and drove past the Erebus Ice Tongue (an ice sheet working its way down from Mt. Erebus), Big and Little Razorback Islands, and past Cape Evans (another place I wrote about before), all the way out to the Barne Glacier. What a flabbergasting place. 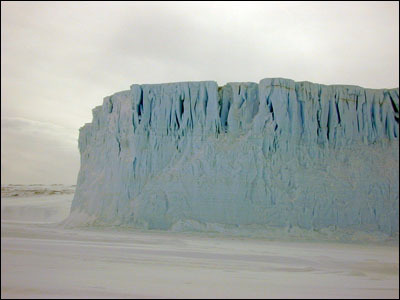 The glacier is about 180 feet tall and does a sheer drop off at its edge. We were below it. They told us we could go over closer to it, but not more than about 75 feet away. You never know when a section of ice is going to slide off. I am afraid that none of the photos give a sense of how enormous this thing really is. However big you think it looks, it is really bigger. I could have stopped the trip right there and been perfectly happy. We had lunch there so we did get to spend some time. 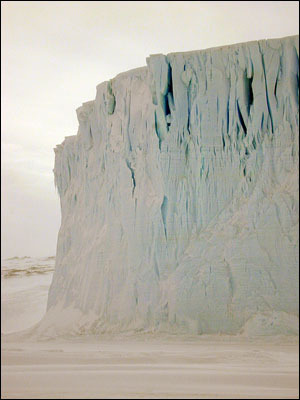 Then it was back on the Ski–Doos for several more miles to a huge iceberg. There were seals there also. 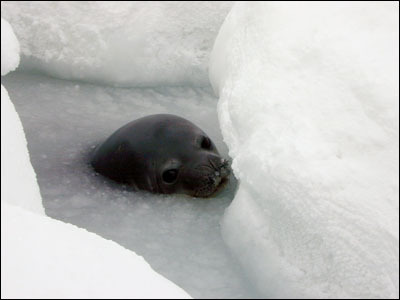 There was even a Crabeater seal, which is very rare around this area. 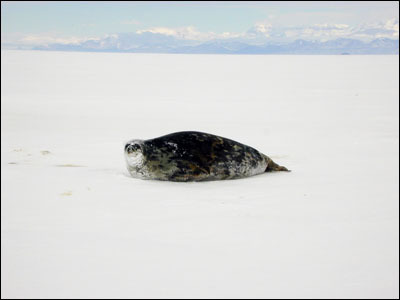 The seals in this area are Weddell Seals and are larger and darker than the Crabeaters. 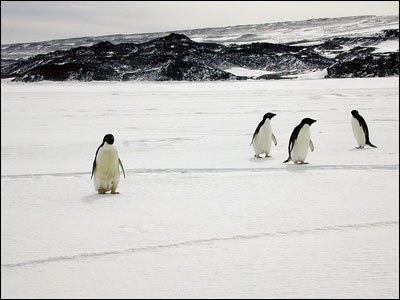 While we were looking at the seals, all of a sudden five Adelie penguins popped up out of the water — and I mean popped! They were so adorable. They were smaller than I expected but so cute. They got curious about us and all walked over to see what we were. They got about 20 feet away from us and just looked and looked at us, cocking their heads this way and that. Then they wandered off. This iceberg where we were stopped was frozen in the ice and not floating freely, but has in the past. It is about 75 feet tall. According to the divers, this iceberg extends beneath the surface about 250 feet down. 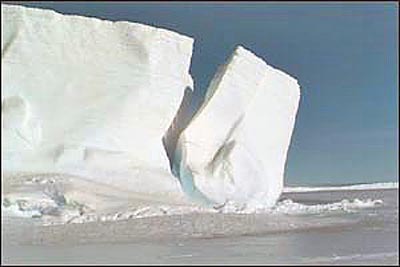 Icebergs are generally larger under the water than they are above the water. 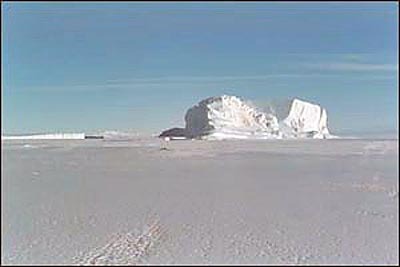 This particular iceberg is calving, in other words a large part of it is breaking off. It is a slow process. Our guide, Ted, is also part of the Search and Rescue team here and so he took his prod and axe and went through the crack to see if it was safe, and then he let us walk through the iceberg. It took us a long time because everyone wanted to stop and have their picture made in there. We got back on the Ski–Doos and headed to Cape Royds. We finally arrived there around 1:00 P.M. We hiked over a hill and arrived at the hut. 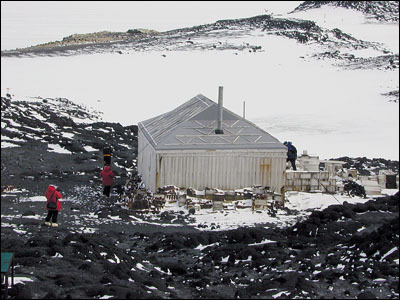 This hut is much smaller than the one at Cape Evans, but is much more magical. I am not sure why. Perhaps it is because Shackleton built it and he is really a hero of mine. It feels more alive than the other huts. Perhaps it is also because I have seen so many photos of the early explorers taken in this hut that it is easy to picture them still there. 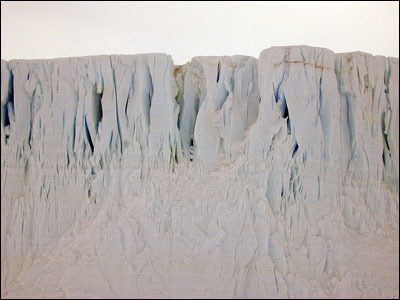 No one had yet reached the South Pole in 1908 and this expedition accomplished many things: the first ascent of Mt. 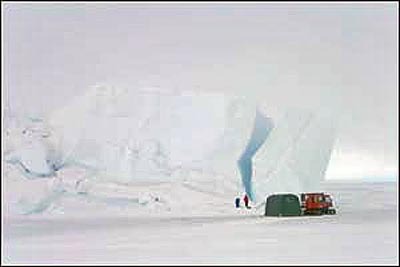 Erebus, the first journey to the South Magnetic Pole, and the discovery of the Beardmore Glacier. They also came within 100 miles of the Geographic South Pole on this trip. 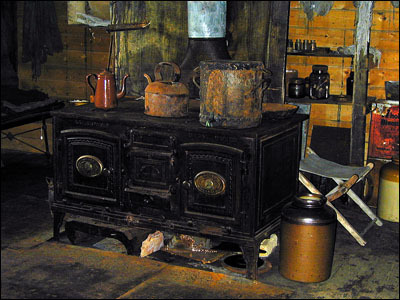 Not a single man was lost on this or any of Shackleton's expeditions. Shackleton was later knighted for his efforts here. The man who did finally reach the South Pole was Roald Amundsen, beating Robert Scott by one month. Raymond Priestly, a member of both Scott's and Shackleton's expeditions was quoted as saying, quot;As a scientific leader, give me Scott; for swift and efficient Polar travel, Amundsen; but when it seems like all is lost and there is no way out, get down on your knees and pray for Shackleton." He was a brilliant man. It was quite a privilege to stand in that place and picture what it must have been like for them at that time. We were allowed to wander the area for close to three hours. There is a penguin rookery there as well. They were all nesting so we could not get too close. We had specific areas we could go. 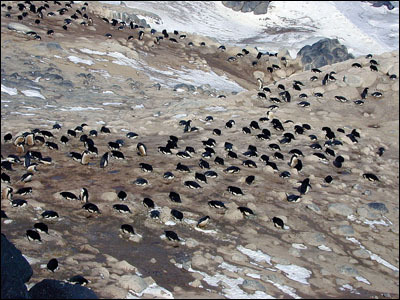 There were hundreds and hundreds of Adelie penguins. I am told that the smell is pretty bad if you are standing down wind, but it did not seem too bad to me. However, I liked the smell of the circus when I was working there as well! It was too exciting to be there for any part of it to be bad. Finally around 3:30 we headed home. We made one more stop along the way. 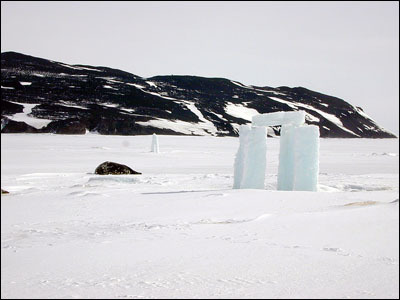 Some time earlier this season someone cut some huge blocks of ice and made what we call Icehenge. There are seals there as well. 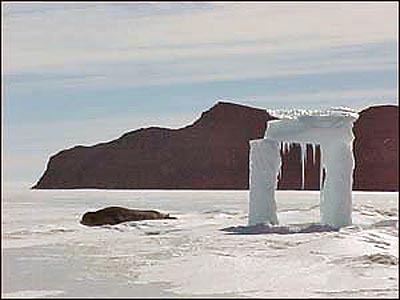 Icehenge is starting to melt these days, and it will be gone by the end of summer. We arrived home around 5:30 in the afternoon. It was quite a day and we were all very tired. 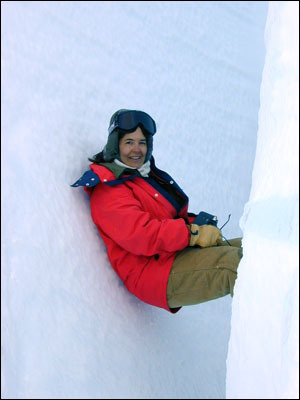 An entire day spent outdoors in the Antarctic really takes a lot out of you, but it was such great fun. As an exciting postscript to this story, just a few days ago some of the historians from the Antarctic Heritage Trust were working in the Cape Evans Hut and discovered a wallet which had some material in it dated from 1914. There was enough evidence to place the wallet definitely from that era, and also they think they can identify who it belonged to. There were a few photos in it and some tickets from somewhere in Australia. It was found behind some of the wall boards.